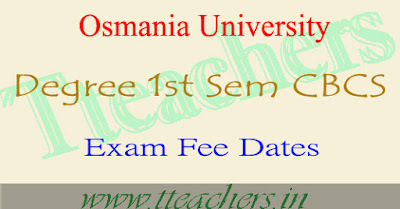 OU Degree 1st semester exam fee last date 2016 & time table :It is hereby notified to all the eligible Regular candidates of B.A./ B.A(other courses) / B.S.W / B.Com. (General)/B.Com.(Computers)/B.Com. (Honours) B.Com. (other courses)/B.Sc./B.Sc. (other courses) , B.B.A course(s) I Semester (CBCS) enrolled during the academic year 2016–2017, the following is the schedule for the payment of examination fee and submission of examination application forms at their respective college(s). Payment of Examinations fee and submission of Examination application forms at their respective colleges. 2. 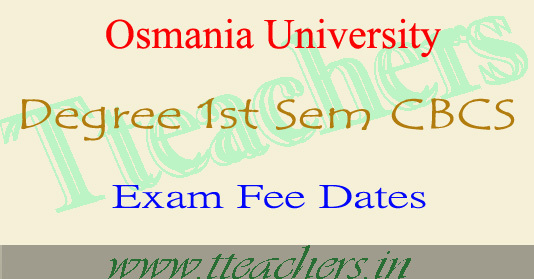 Remittance of consolidated Examination fee to Registrar, Osmania University Exam Fee Fund A/c No. 52198262033. The college login will be closed after the last date. The late fee amount will be levied automatically in case the fee is not Remitted to the O.U. A/c and forms are not submitted as per the above schedule. 1. The details of Examination Fee schedule is enclosed. 2. The exact date of commencement of the Examinations and detailed time table will be notified later. 3. The Examination fee once paid by the candidate/college will not be refunded or adjusted. 4. The Examination application forms of I - Semester eligible students (i.e. admitted to I Semester during the academic year ) are to be submitted online through college login. Also, hardcopy of the same may be downloaded and submitted to the examination branch duly signed by the Student and the Principal concerned along with photocopy of Qualifying Examination. 5. Not to collect the Exam fee from Blind, Physically Disabled, Deaf & Dumb students as per O.U Order No. 1555/228/2007-08/Budget-V, dated: 25-03-2008. A Xerox Copy of Medical Certificate confirming their status as Handicapped (minimum percentage of disability must be of 40%) must be attached to the Application forms. Blind, Physically Disabled, Deaf & Dumb Students Application forms should be submitted separately along with Separate Nominal Roll. a) Inform all the concerned candidates that the payment of examination fee & submission of application forms will not be entertained after the due date under any circumstances. The Examination fee once paid by the candidate will not be refunded or adjusted. b) Instruct the students to enclose the Xerox copies of the memorandum of marks of earlier examinations to verify eligibility, and Equivalency Certificate issued by the Board of Intermediate,T.S, if the candidates are from other board. c) Prepare separate nominal rolls for Other courses & Honours students and send the forms separately, otherwise their forms will not be accepted. d) Note that the H.T No allotted to a candidate at the time of admission shall not be changed or allotted to another candidate, even if the first candidate has cancelled his/her admission. e) Forward only the Examination application forms of the candidates who have put in required Percentage of attendance. 6. The University has decided to accept the payment of Examination fee through Core Banking System from the Colleges under Osmania University Jurisdiction Under any Circumstances CASH/ Demand drafts will not be accepted. I. It is required to transfer the fee amount through RTGS / NEFT for credit into Registrar Osmania University Exam Fee Fund A/c No 52198262033( SBH, O.U Branch, IFSCode “SBHY0020071”). 7. Application forms with all the requirements should reach the Examination Branch, OU, on or before 30th November, 2016.. A penal fee @ Rs.1,000/- per faculty will be collected per day from the college on applications received after 30th November, 2016. 8. Consolidated fee receipt obtained from the SBH Bank may be submitted to the Deputy Registrar (Cheque-II) Section, Examination Branch, O.U, where Receipts pertaining to B.A/B.Com/B.Sc/B.B.A will be issued separately. (In no case individual receipts submitted by students will be accepted). a. Affiliation orders issued to the colleges for the Academic year 2016–2017 for the various courses for which Examination forms are to be submitted. b. No Dues certificate issued by the Academic Branch, O.U. c. Clearance Certificate from the Director, Directorate of Academic Audit, OU. f. Fees Abstract One hard copy of the Fee Abstract Prepared/downloaded using the link provided at College Login. g. Nominal Rolls: One hard copy of nominal rolls (consolidated list of candidates) generated using the Students online information System after due verification by the Principal and I year Nominal Roll signed by the Director, Directorate of Academic Audit, O.U. h. This notification is available on website www.osmania.ac.in. All B.A., B.Com., B.Sc., B.S.W. & B.B.A. I – Semester candidates who are appearing for the University Examinations for the First time should pay Examination Processing Fee of Rs. 200/- (on time basis) in addition to the examination fee. Kindly, collect the examination Fee from the candidates for Annual Examinations -2016 as mentioned above and remit the same to the Registrar OU Fee Fund A/c No.52198262033 as specified in the notification.